When I rode to Santa Monica/UCLA hospital to visit my mother, yesterday, I was delighted to see that their handsome new building (yes, a hospital that actually fits in with and enhances the streetscape!) includes a nice portion of well-placed bike parking. Right by a busy entrance, under a portico, hidden from the street but not from the eyes of staff and visitors. And it was full of bikes! I also was aware that one of three motorists was talking on his cellphone while driving; and one of three bicyclists had his iPod bug in his ears: everyone is driving/riding distracted. It is the bar scene from Star Wars (in LA, it may be the bar scene from Sodom and Gomorrah...on wheels). I arrived in front of the Pan Pacific Auditorium a half an hour before ride time, but there were riders already trickling in, with the trickle becoming a torrent within minutes, and soon we were handing round those silly waivers that are de rigueur for these rides, meeting and greeting, and preparing to warm up the crew with a bit of hot air before sounding the bugles. A number of stalwarts of the LA bike scene showed up, despite the earlyish hour, with mr. rollers, John Vu, Brian C., Johnny Lam, and others having rolled in from far and wide, as well as LACBC folk, of course, including Ross Hirsch, Colin Bogart, Ramon Martinez, and of course JJ Hoffman who was co-leader (but had to speed ahead to get things ready at the other end). I was particularly glad to see Jeff Jacobberger of the Mid City West Community Council and LADOT bike blogger Chris Kidd as well, and too many other wonderful folks to name in a quickie blog post. We took off on time, staring back at dozens of cameras and camcorders aimed almost ominously our way, wound through the back streets east of Pan Pacific Park, and gathered in a glittering heap at 4th and Cochran, where the ride, and the prospective boulevard, officially began. Riders ranged in age from around 5 years old to quite elderly, and there were women along, and whole families. There were road bikes, fixies, hybrids, cruisers, tandems, and at least one recumbent, touring bikes, and one pair of training wheels (whose perky little pilot insisted on riding the whole route, though her mother offered to lock up her bike and carry her the rest of the way in the kid seat). Dorothy Le, Ramon Martinez, Council member La Bonge, mom Meghan Hirsch, Jeff Jacobberger, Howard Krepak, a lawyer specializing in bicycle accidents, and Mike Russell, a representative from the Wilshire Business Improvement District, held forth on the benefits a bicycle boulevard would bring to the area. Everybody loved 4th Street, loved the ride, and more important, loved the idea of a bicycle boulevard for Los Angeles. Now, the hard part: getting it done! Here's an idea for "instant bike lanes" all over Los Angeles. Eliminate on-street parking; and dedicate that lane for bicycles. Suddenly, new parking structures and parking lots will pop up all over the city in places where vacant buildings, etc. etc. now stand as landlords are always wanting to make a buck. He pointed out that that would be a state, not a city, matter. But then I began to wonder: perhaps the city could just make current four-way stops into four-way yield intersections. The degree of uncertainty that would intorduce might just get all users--cyclists and drivers alike to approach the intersections more cautiously. Both groups almost universally roll stop signs anyway, especially four-ways, under the assumption that cross traffic will stop, leaving it clear for them. Of course the cross traffic is thinking exactly the same thing. There is one very short stretch of 4th Street here in LA where I have come across three crashes at four-way stops--twice involving pairs of SUVs driven by well-dressed, obviously wealthy (and quite indignant) women, and once where two thirtysomething male cyclists had tangled and were standing in the middle of the street by their tumbled bikes, swearing at each other. Four-way yield might make everyone slow down a little more and look around a little more thoroughly. Takes away any comfortable assumptions about what the other guy will do. Thursday, July 22nd, the Tour de France attacks the Tourmalet, one of the Great Climbs of the race, and one that has been part of a stage more often than any other in the Tour's long history. Eighteen kilometers at an average gradient of 7.5%, it would be a tough climb even if it were not preceded by two other Category 1 mountain passes. Why a sale in honor of a climb? 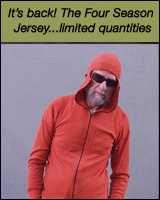 Well, after all, in the mountains you can be in warm weather riding through the foothills only to find yourself in bone-chilling cold at the crest, so why not associate a a paradigmatic climb with our jersey for all seasons? Though it's summer where most of our customers are, it's still a good time to buy, since fall is coming apace, with winter not far behind--and the jersey's price goes back up after the end of the stage. And oh, yeah: this offer combines with our Tour de France Free Shipping Offer for purchases delivered to a US address for the entire duration of the Tour de France! So sometimes things work the way they should. A few weeks ago I was whining to Chris Kidd, the LADOT bike blogger, about (can you guess?) the sad state of bicycle infrastructure in Los Angeles, and he referred me to a Carlos Morales, the coordinator presently in charge of bike racks at LADOT. In particular I was nagging about a damaged rack in front of Black Dog Coffee a couple of blocks away. Carlos said he'd get on it, and suggested I send him a list of other locations that I thought deserved bike parking in my 'hood. Poor fellow, of course he got a comprehensive list! Well, we went back and forth, and today he sent me an email suggesting I go look at the spots he marked for bike racks. Damn me if he'd not only marked nearly every spot I'd mentioned, but had added a few on his own! So, within a couple of months the stretch of the Miracle Mile between La Brea and the Tar Pits will receive twelve, maybe more, much-needed bike racks. In case you want to see what a bike rack looks like in the embryonic state, I've appended some snapshots below. 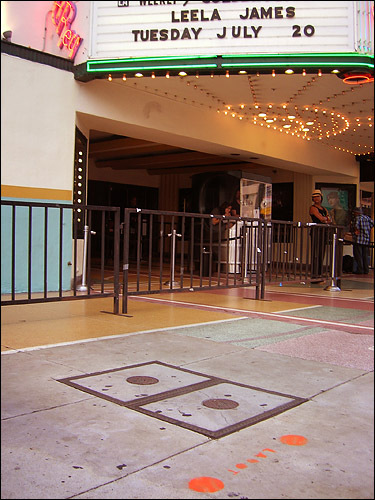 The orange blobs with the legend "LADOT" between them...that's where they'll go. Speaking of which, I also extracted a lot of history from Box--how he became an activist, what projects he's worked on besides the bike advocacy my crowd is familiar with. He's looking much more like a viable candidate to me as I learn more. But you'll hear about that in detail later on, when I've dug a little deeper. This weekend, from July 23rd to July 25th, Performance will celebrate the grand openings of its new Woodland Hills and completely remodeled Santa Monica stores with the Bike Tube Blow-Out, a recycling program sponsored by Performance and Liberty Tire, the largest scrap tire recycler in the country. During the weekend, anyone can bring their used or blown-out inner tubes to the store and receive up to three $5 money cards for the tubes they recycle. Liberty Tire Recycling, the nation's largest collector of used and scrap tires, will turn the bike tubes into mulch for playgrounds, athletic fields, railroad ties and highway asphalt, among other uses. The company collects and recycles nearly one-third of all of America's annual scrap tire material and has cleaned up more than 150 dump sites littered with nearly 40 million scrap tires�"more than any other organization. "We estimate that a major city can annually generate several tons of used rubber just from blown out bicycle inner tubes alone," said Jim Thompson, CEO of Performance Inc. "Our aim is to make bike inner tubes a proven reusable resource for playgrounds, manufacturing and other applications." Performance's Woodland Hills store is an entirely new location. 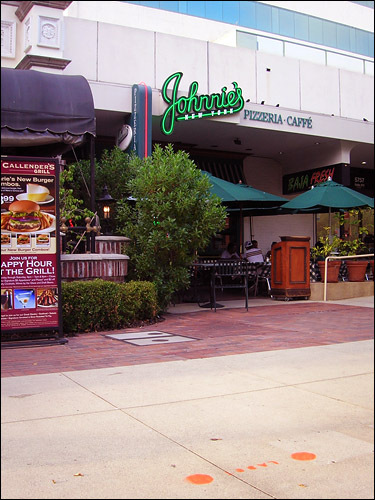 It's located at 6400 Owensmouth Avenue. 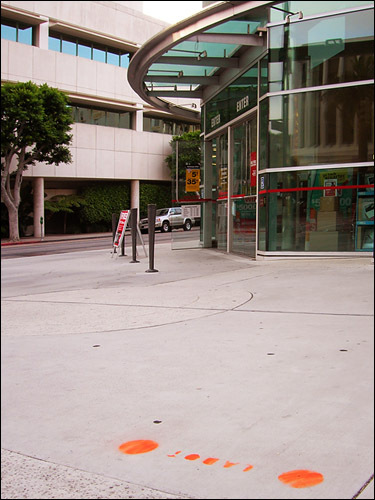 The Santa Monica store, one of the most popular Performance stores in the country, is located at 501 Broadway, at the intersection of 5th Street and Broadway. I find it a little puzzling, as most blown tubes can be patched and re-used, which is considerably better than putting more energy into recycling them. But since in real life folks do throw away so many tubes, it's still worth bringing them in. But it would be much better if they'd accept worn-out tires for recycling as well,; those can't be revived with something as simple as patching, and contain a lot more rubber anyway. 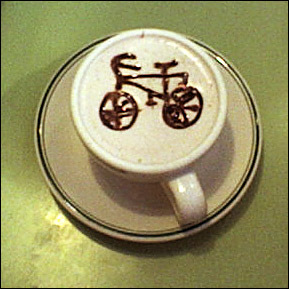 Looks like Dennis Bean-Larson, the mastermind behind the Fixed Gear Gallery, is at it again! 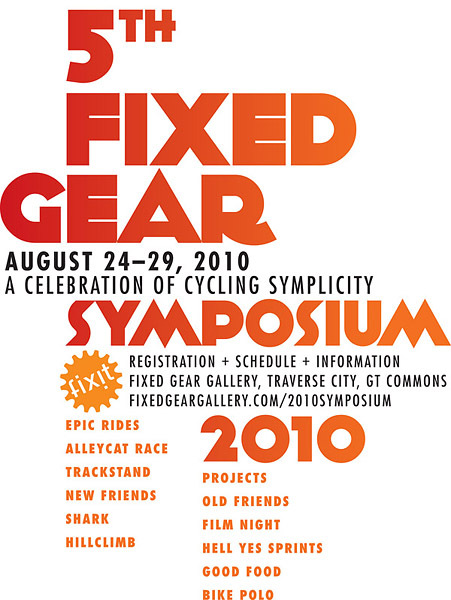 Doings include rides, hillclimbs, races, contests, polo, films, food, and just plain hanging out and socializing with fellow fixie aficionados. 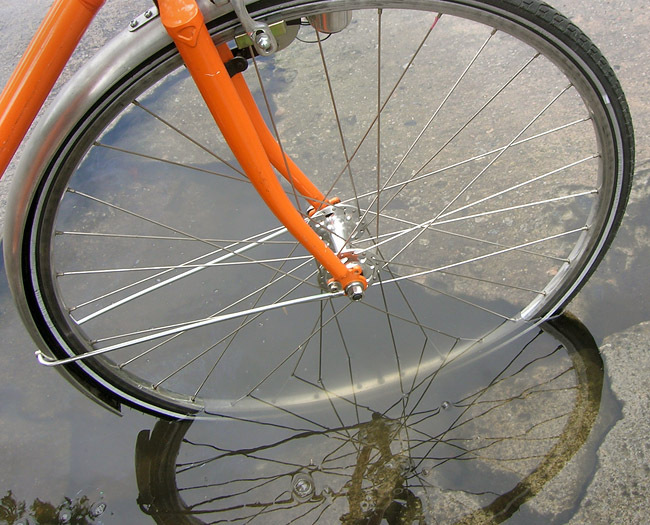 So if you're a fan of the fixed wheel, check it out right here, at Dennis's Fixed Gear Gallery. The gallery, of course, is also host to over ten thousand photos of fixed-gear bicycles of all sorts and, from antiques to neon whips fresh out of the UPS box, from pure track bikes to tricksters to fixed-wheel touring rigs--one of the most pleasurable distractions on the Internet! Sounds like fun; wish we could go! 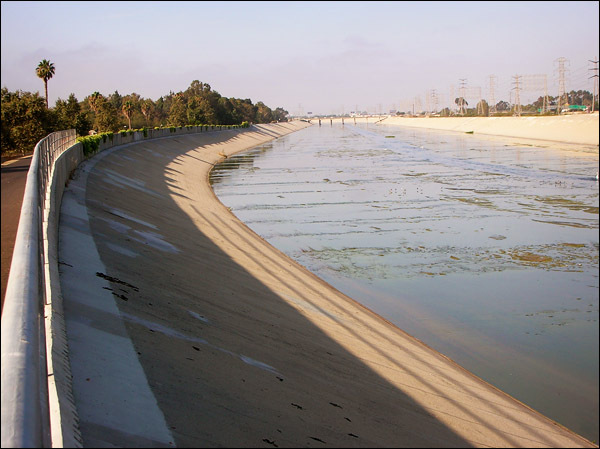 Another ride down the Los Angeles River bike paths yesterday, on a set mild day that actually turned a little cold when I got to Long Beach, where the river simpers into the walled-in waters of the San Pedro Bay. 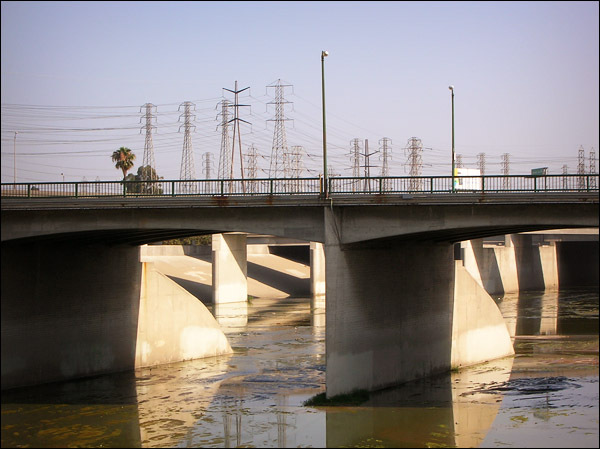 The river, as most know, is presently encased in concrete for most of its length, and most people see it as grim. I see it as an accidental sculpture, a kind of circumstantial aesthetic expression of the engineer's love of balance and order at the expense of everything else. Yet it is nonetheless beautiful in its own way, as a balance of light, space, and surface, a stolid counterpoint to the crisscrossing nervous movements of birds, electricity, freeway traffic--and bicycles. One minute in on the river path, and I was away from the diesel clatter of the flats and in a nearly silent world, the river's shallow humidity gleaming beside me while white birds wheeled in twittering multitudes and stately egrets posed. Seventy miles down and back, with a stop at a friend's house where a ride was gathering--one I didn't have time to join that day. 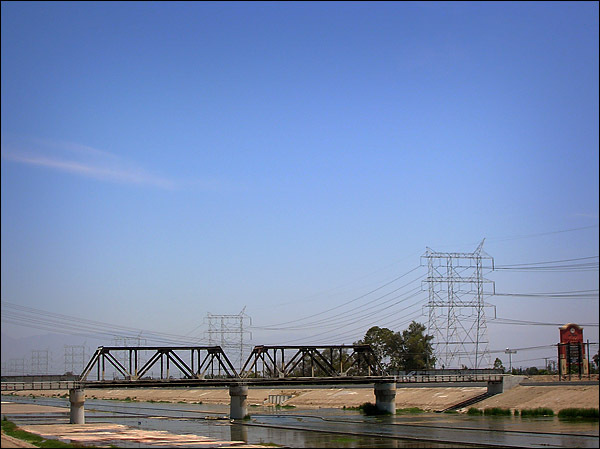 Then back up, this time past Imperial Highway, where I'd gotten on the river, to where the path, its last northern miles paved with spray-painted gang tags, presently ends. Finally slanting across the absolutely blank flats of Vernon, Slauson, and the other industrial townlets, shuttered for Sunday rest, till I found downtown and familiar territory. Someday, they promise us, the river path will grace the full fifty-five miles of the river's length, and will connect with a grid of bikeways, and be restored to something more recognizable as, in fact, a river. But for now, this is what it is, and it's not too bad, if you look at it with a neutral eye. Things may be looking up for 4th Street; LACBC's project to optimize it for bicycle transit by making it a bicycle bouelvard is starting to build momentum! 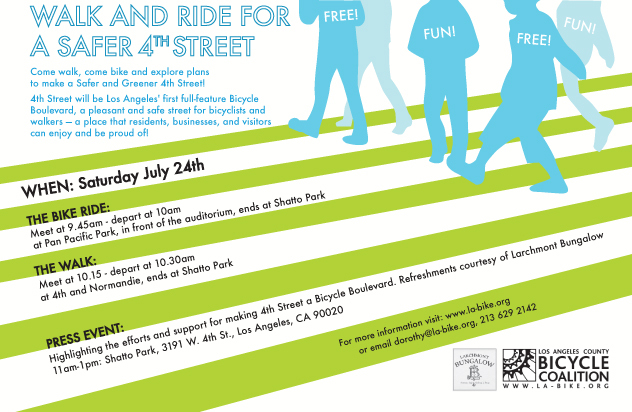 On Saturday, July 24th , LACBC is hosting a ride, walk, and press event to familiarize neighbors, cyclists, business owners, city officials, and the press with 4th Street, the bicycle boulevard concept in general, and the specific benefits to local stakeholdersof making 4th LA's first bicycle boulevard. 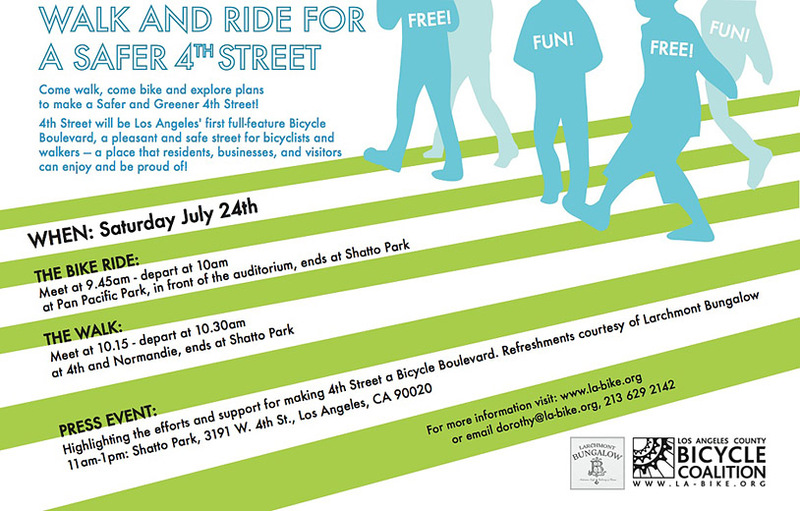 So grab your bicycle and join us on Saturday, July 24th , at 9:45AM in Pan Pacific Park, in front of the auditorium. LACBC will be there to provide information and support, and we will hear from residents, business folk, the police, and city officials--including City Council member Tom LaBonge. Don't have a bike? There is also a guided walk meeting at 4th and Normandie at 10:15AM. Both walk and ride will end at Shatto Park at 4th and Vermont for the press event and refreshments at 11:00AM. Learn why a bicycle boulevard is a simple and inexpensive way to make 4th Street cleaner, greener, quieter, and safe for residents, local drivers, joggers, dog walkers, kids and old folks, and LA's commuting cyclists, and how it can reduce the need for ever-more-expensive road widenings in your neighborhood. And by the way, Bicycle Fixation editor Rick Risemberg will be leading the ride, with Larchmont Village's JJ Hoffman riding sweep to help keep everybody safe. LA Really Needs a Jolt Right Now! While incumbent Labonge often talks up bike issues, arranges constituent bike rides in CD4, and seems genuinely to love riding his own blue Miyata, he hasn't really delivered on cycling issues such as lanes, parking, sharrows, and bicycle boulevards, beyond offering lip service--or so it seems to me. Every move LA has taken to broaden transportation choices has been met with either a leaden inertia or straight-out stonewalling, so that while cities big and small even within our own county--Long Beach and Santa Monica, for example--implement sharrows, install bike corrals, and open bicycle boulevards, LA's administration, from the Council down to DOT, keeps saying that such things just "can't be done." Though it seems that road widenings, speed limit increases on neighborhood avenues, and massive automobile-dependent developments always can be done, and no expenses spared. 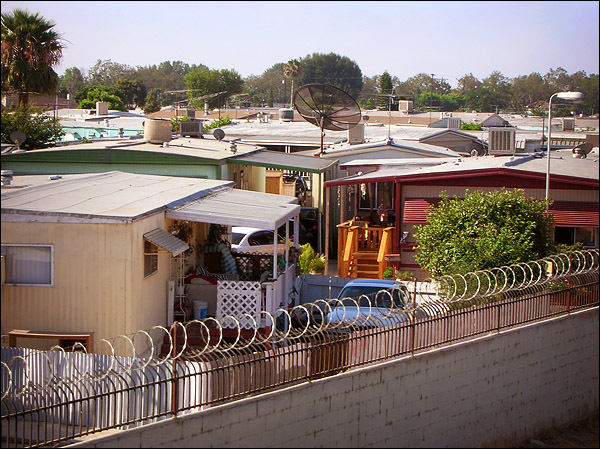 Transportation is the dominant feature in Los Angeles's development. From the days when we destroyed one of the finest rapid transit systems the world had known, through the dissection of entire communities by ten-lane freeways and their interchanges, to the struggles of rebuilding what is becoming an effective though not yet comprehensive Metro, and now the growth of our present efforts to nurture the widespread use of bicycles that the city is ripe for, "mobility" has defined the character of LA. And has defied it as well, making of us less a city than a collection of lost souls entrapped in rolling tin purgatories. Box, if he wins, would be the strongest voice not only for cycling but for sustainable development in general on the Council. But can he win? LaBonge has been in the administration as staffer or council member since 1976 and is well-entrenched; he is also one of the best friends the old-school development community has ever had here in recent years. Box could bring a new style of development to LA--one that in the long run would result in a more efficient government and more prosperous communities--but will the business-as-usual crowd, who have been living a continuous birthday party in LA at the city's and its neighborhoods' expense, understand that, or will they reflexively oppose his candidacy?. If you live in LA, and particularly if you live in CD4, check out Box's platform on his new website today: StephenBox.com. While his platform is still not well defined, he has somewhat of a track record, and this may be our first real chance to own the future. 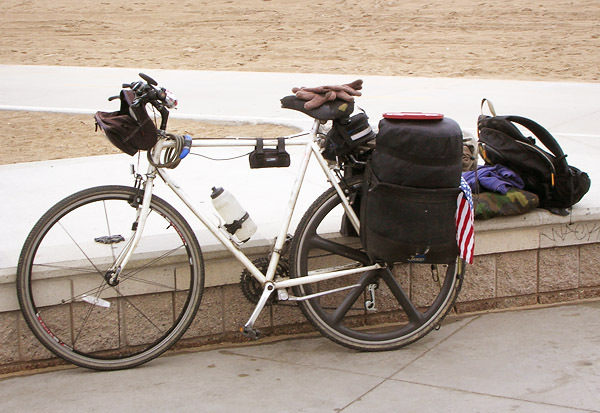 While at the beach I saw this bike, an old Shogun, that one could only call comprehensive. Prefer front loading? Rear loading? Knapsack? Why not all three! Low spoke count wheel in front, Aerospoke in back, and cyclocross tires on both--why not? Lock, lights, mirrors, and a big bell. I spoke to the owner briefly, a fellow named Greg. The low-spoke front wheel had been part of a set taken off a carbon road bike that "snapped in half" during a collision; the rear one had pulled spokes through the rim and eventually cracked its hub under the heavy loads Greg carries when he's going out camping, so he snooped around the internet and went for the Aerospoke in back. The frame is an old Shogun touring model. The fellow puts on the miles, and loves the bike. We've lowered the threshold for our Tour de France Free US Shipping promo! Now, any order totaling $100 or more will qualify for free US shipping--that's to anywhere in the US, as well as APO/FPO addresses. And we ship by Priority Mail, so you'll get your stuff right quick! Indeed, maybe trying to get the City of Los Angeles to fix the infamous "Hudson River" on 4th Street will be my life's work after all...since they seem completely uninterested in doing anything more than dumping some cold patch into the water and dancing around on it a little bit. I have personally called it in to Bureau of Street Services five times, and, bless them, five times they have indeed come out and patched it. It has been filled with water day and night for over a decade, the result of outflow from a sump pump half a block up the street. This on a designated bike route heavily used by LA cyclists, and which the LACBC (with whom I am working on the project) is hoping to make LA's first bicycle boulevard. Several cyclists have broken bones here, and at least one is suing the city. 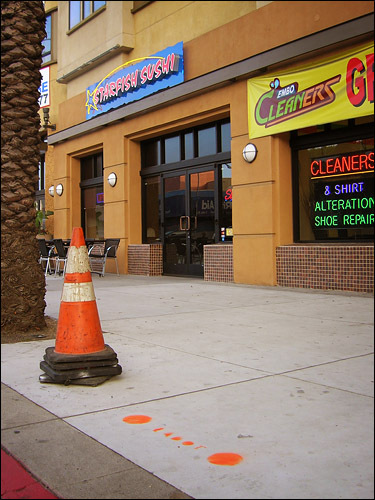 My question is, Why can't LA put a trench drain across 4th St. here, so that the water doesn't pool and undermine the pavement, and no longer nurtures algae growth during the warmer months? (And in LA, most months are warmer months....) There are plenty of them on streets surrounding the Hudson River. I'll call it in again, but it would be nice to have it fixed for real, you know. If you want to help, you can join us at LACBC in our project to make 4th a bicycle boulevard...or if you live in CD4, contact council member Tom LaBonge's office about it--but only if you've had personal experience of the Hudson River. We are happy to announce a Tour de France promotion of our entire Bicycle Fixation product line! For the duration of the Tour, we will offer free Priority Mail shipping to any US or APOP/FPO address for any order over $150. So you won't have to wait long to enjoy your knickers, jersey, shorts, hats, or whatever combination thereof adds up to a hundred and fifty bucks. Just click on over to our shopping page and check out what we've got! You know the ones I mean: they write all those anonymous online comments to news articles and blog postings that have anything even slightly positive to say about bicycling, complaining about evil velocipedal fiends who run stop signs and don't pay for the road. Who are, oh my, arrogant! I get tired of that BS, I really do. For one thing, cyclists of course overpay for the share of the road that they use, since car and fuel taxes never cover more than half of the costs of just building roads, and usually far less--and it's cars, not bikes, that need all that asphalt and tear it up so damn fast. That's right, Driving is socialism! And as for road manners, whom are these clowns trying to fool? Just today, as I was riding through a residential area on my way to visit Mom, I saw three cars in a row blow through a four-way stop, and a little later I was cut off (in the bike lane on Venice) by a fool making a right turn from the center lane. It isn't cyclists who kill 40,000 people a year in the US, after all. I wish they'd just shut up, sometimes. Sorry to vent online about it, but really, I don't know whether ti's the willful ignorance or the hypocrisy that irritates me more. Okay, back to somewhat more reasoned discourse in future blog posts...cheers!